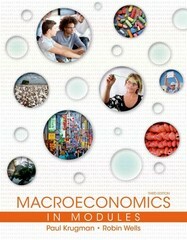 Macroeconomics in Modules 3 Edition Adapted by Paul Krugman and Robin Wells from their bestselling macroeconomics textbook, Macroeconomics in Modules is the only text for the principles of macroeconomics course organized in the supremely accessible, highly effective modular format. Instead of chapters of standard length, the book covers the fundamentals of macroeconomics in 49 brief (4-10 page) modules divided into 14 sections. Macroeconomics in Modules offers the best of what makes Krugman/Wells a classroom favorite (story-telling approach, engaging writing, fascinating examples and cases), in a format students and instructors will love. Extensive educational research shows that students absorb more from shorter reading assignments than longer ones. And with coverage in self-contained modules, instructors can assign specific topics without asking students to read entire chapters.